Project: A new office building expansion for the headquarters of ProLeiT, a process control technology and automation solutions provider. A modern work environment will be added, which will accommodate approximately 250 employees. The new spaces will cover 4,500 square meters. An underground parking lot with more than 70 spaces for employees and visitors will be added below the building. 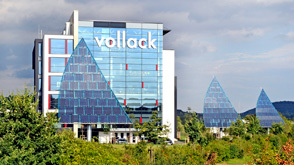 A connecting bridge will link the expansion with the existing building built by Vollack in 1999.